Surgery repaired sports hernia that had occurred earlier this season. SACRAMENTO, Calif. – Sacramento Republic FC midfielder Adam Moffat underwent surgery earlier this week to repair a sports hernia. Dr. William Brown performed the successful surgery on June 21. Moffat is expected to fully recover and made available within 8-10 weeks for play. Moffat has made six appearances, including four starts for Republic FC this season, playing 383 minutes. Moffat joined Republic FC after playing the 2015 and 2016 seasons with the New York Cosmos (NASL). Sacramento Republic FC dominate possession and score two second half goals to win their USL season opener over Seattle Sounders FC 2 for the second consecutive season. 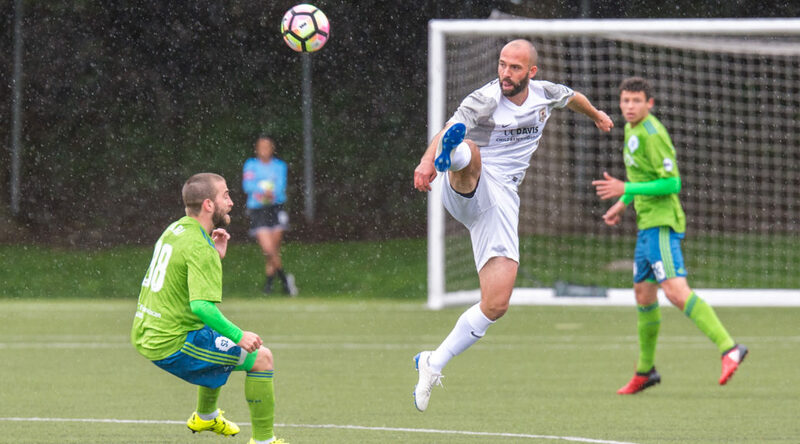 Sounders FC 2 came out of the gate strong, applying solid pressure on the Republic FC defense who were able to stifle most of the early chances. S2 would break through however in the 5th minute on an Irvin Parra free kick. After a foul about 35 yards away from goal, Parra stepped up and sent a short free kick that bounced a few times before finding defender Brian Nana-Sinkam who drove a shot on goal that skipped up right in front of goal, hit the bottom of the post before bouncing against the ground and up again into the top of the net, giving S2 the early 1-0 lead. Republic FC seemed energized following the goal and went on to dominate the possession for the remainder of the half, owning 55 percent of the ball in the first half. Republic FC had one of their best looks on goal of the first half in the 23rd minute after an interception by Sammy Ochoa. The forward moved the ball down the middle of the field before laying it off to midfielder Adam Moffat who had come up in support. Moffat then took a strong shot toward the far side of the goal, but a diving Bryan Meredith was there to knock the ball away from goal and keep S2’s narrow 1-0 lead. In the 32nd minute Ochoa would instigate another Republic FC attack. Ochoa took the ball down the right side of the field almost to the goal line before picking out forward Tyler Blackwood who was all alone on the left side of the box. Blackwood settled the ball before sending a curling shot toward the top right corner of the goal, but the shot missed just high and wide of the goal keeping the match 1-0 at half. Republic FC continued their dominance on the ball in the second half and were rewarded in the 65th minute. Midfielder Agustin Cazarez knocked down a short clearance by S2 right to the feet of defender James Kiffe at the top of the box. Kiffe took a strong left footed strike toward goal that deflected off Ochoa who was perfectly placed in the box. Ochoa’s deflection beat Meredith and found the goal just inside the far post, leveling the score 1-1. In the 70th minute it looked as though Republic FC might have taken the lead. Moffat found a loose ball near the top of the box and one-touched a left-footed strike that hit the inside of the far post, rolled along the line, hit the near post and then looked to be in the goal, but was judged to have not crossed the line as Meredith ran quickly to retrieve the ball. Republic FC would find the go-ahead, and ultimately winning goal, in the 83rd minute. After a barrage of shots by Republic FC, the ball was cleared, but only as far as Ochoa on the right side of the box. The forward tapped the ball back to substitute defender Emrah Klimenta, playing in his first USL match since tearing his ACL in a match against S2 on July 2, 2016. Klimenta took a touch forward before blasting a grounded shot toward the far post, that got under the arm of a diving Meredith and into the back of the net giving Republic FC the 2-1 lead. Republic FC dominated the possession in the match, earning 61 percent of the possession and outshooting S2 28 to eight. 28 shots is a record in a single USL match for Republic FC, beating the previous mark of 24 against Arizona United SC on Sept. 19, 2015. Republic FC also tied their record for most shots in a single half with 15 in the second half, tying their second half performance against Orange County Blues FC on Aug. 17, 2014. Republic FC will return to Sacramento for their Opening Night at Papa Murphy’s Park on Saturday, Apr. 1. They will take on Orange County SC with kickoff scheduled for 7:30 p.m. Tickets are available at Ticketmaster.com. Goalkeeper Dominik Jakubek and Sacramento Republic FC’s defense hold the San Francisco Deltas scoreless as the two Northern California sides play to a draw in Deltas’ first home match at Kezar Stadium. The first half of the match was hotly contested with both sides trying to make their mark on the match. The San Francisco Deltas would have the first strong look at a goal in the 9th minute following a giveaway in the middle of the pitch. Midfielder Kyle Bekker had a one-on-one opportunity with Republic FC keeper Dominik Jakubek, but Jakubek was able to get to a knee quickly to block Bekker’s shot. The forward was there to collect the rebound however, and looked to loft a shot over Jakubek who was still on the ground, but the keeper was there again to save the second shot, corralling the rebound to keep the match scoreless. Republic FC would see their best chance of the half in the 20th minute. Midfielder Danny Barrera took a corner that found fellow midfielder Adam Moffat at the back corner of the box. Moffat took a few touches before laying the ball off to midfielder Agustin Cazarez who sent a beautifully curling cross toward the back post. Deltas’ keeper Romuald Peiser was forced to make a leaping deflection, but only as far as Barrera who was backing up the play. Barrera, however, was called offside, ending the play and leaving the match scoreless at the half. Republic FC came out as the aggressor in the second half, attacking the defense early and often. In the 47th minute they would have their first strong chance on goal. After driving the ball toward the right corner of the box, Barrera laid the ball off to defender Emrah Klimenta who was making an overlapping run on the right side. Klimenta then fired a low cross into the box that found Trevin Caesar but the forward’s shot was deflected high off the goal. The Deltas’ best look of the second half came in the 65th minute. Midfielder Jackson received the ball near the right corner of the box following a few back and forth passes on the right side. Jackson found a clear shot on goal, but Jakubek, who covered his inside post perfectly, saved the midfielder’s strong effort. Despite a push by Republic FC’s substitutes in the final quarter of the match, neither defense would yield a goal, ending the match in a scoreless draw. Republic FC will return to Papa Murphy’s Park on Wednesday, Mar. 22 when they take on the San Jose Earthquakes. Kickoff is 7:30 p.m. Tickets are available at Ticketmaster.com. FC Cincinnati score late in stoppage time to finish the preseason friendly with Sacramento Republic FC 2-2. Although tonight’s match up was scheduled as a friendly, both USL clubs played as if points were at stake in the first meeting of these two USL clubs. Republic FC forward Trevin Caesar saw the first chance of the match in the 5th minute after getting behind the defense. Caesar sprinted onto the ball and tried to flick a shot over the oncoming defender, but the shot was deflected out of play by the defense. The ensuing corner kick led to a curling shot opportunity from midfielder Adam Moffat, which was caught by FC Cincinnati keeper Mitch Hildebrandt. Republic FC had another chance on goal in the 18th minute when Caesar streaked past the defense again. The new Republic FC forward drew two defenders with him as he wisely dropped a pass back for Sammy Ochoa who could not get a shot off as the ball rolled past him. Tyler Blackwood was in good position to send the loose ball into the net with a curling, left-footed shot that was saved by Hildebrandt. FC Cincinnati tallied shortly after that in the 21st minute when they were awarded a penalty kick after a disputed foul was called in the box on a free kick from Aodhan Quinn. The midfielder then stepped up to the spot and converted a left-footed penalty strike past a diving Republic FC keeper Evan Newton to give the visitors the 1-0 lead. Republic FC midfielder Jeremy Hall almost capitalized on a loose clearance from FC Cincinnati in the 34th minute, but his shot on goal went right into the waiting chest of Hildebrandt. Danny Barrera, Blackwood and Caesar also had chances in the waning minutes of the first half, but FC Cincinnati was able to hold off the barrage of attacks and maintain their one goal lead. Republic FC equalized in the 65th minute in the form of a goal by defender James Kiffe. The defender was the beneficiary of a superb layoff pass from Caesar to set him up for the goal. Kiffe calmly slotted a right-footed shot past Hildebrandt to tie up the score at 1-1. Second half substitute Wilson Kneeshaw put Republic FC up in the 82nd minute when he tapped in a rebound opportunity after a fantastic shot from Harry Williams. Kneeshaw’s tap-in gave Republic FC a one-goal lead that lasted until the waning seconds of stoppage time. In a last gasp effort for the visitors, defender Paul Nicholson was able to send a perfect cross into the middle of the box to find an airborne Harrison Delbridge, who made no mistake with his header finish. Delbridge, a former Republic FC defender, rescued a draw for FC Cincinnati with the last action of the match, which ended 2-2. “It’s a preseason friendly but we’re really preparing and that’s why we have this match,” said Republic FC Head Coach and Technical Director Paul Buckle. “We wanted to treat it like a USL game and it’s going to be very difficult if this [officiating] is going to continue because even at the end when there’s three minutes of added time, the games over, and [it ended after] 4:30. I know it sounds like sour grapes, but it’s important when they’re pushing to salvage something from a game that should have been dead and buried. But I’m very pleased with the way we’ve come together. Republic FC will return to action on Saturday, Mar. 11 when they travel to Reno, Nev. to take on the newest addition to USL, Reno 1868 FC. Kickoff is 4 p.m.